A few weeks ago, ASRock introduce its new Phantom Gaming X Radeon Vega graphics cards. During an event in Taipei, ASRock has revealed that they are going to release more products during upcoming months. ASRock will introduce the second generation of Phantom Gaming X GPUs in August. The upcoming models will carry the MK2 branding to distinguish from their predecessors. 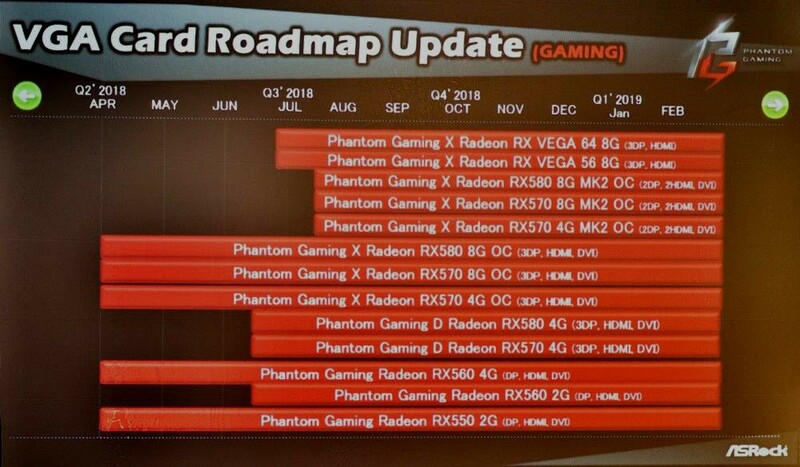 According to the slide, the Radeon RX 580 and RX 570 (in both 4GB and 8GB variants) will be the first two models that will receive this treatment. ASRock will continue to offer its current lineup of Phantom Gaming X GPU alongside with MK2 revision until February of next year. In other words, we might see the RX 600 series during the first part of 2019. Unfortunately, ASRock didn't disclose a lof of information about the MK2 revision. According to latest rumors, the company will change for sure the display connectors. While the original models feature one HDMI 2.0 port, one dual-link DVI-D port and three DisplayPort 1.4 outputs in total, the MK2 revisions will drop one of the DisplayPort 1.4 outputs in favor of adding another HDMI 2.0 port.